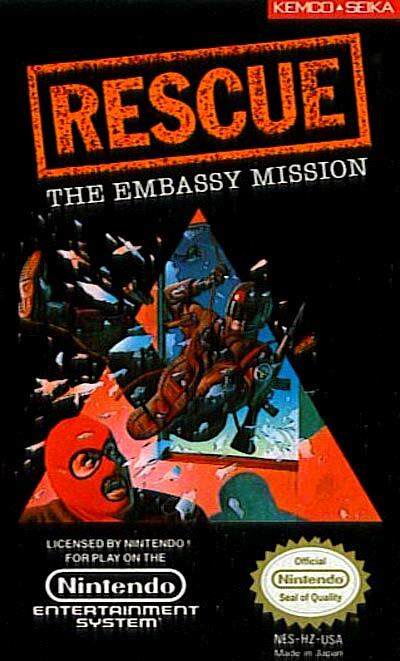 Rescue: The Embassy Mission is an action-strategy videogame, released in 1990 by Kemco for the Nintendo Entertainment System. The player takes on the role of one of several elite SWAT-esque members, whose job it is to infiltrate a building held by terrorists and rescue the hostages. This is accomplished in four parts. In the first part, three of the characters are taken to various spots in buildings surrounding the building that must be infiltrated. Along the way, though, the player must avoid the ever-moving spotlights. Failure to do so results in immediate death. Once the three characters are brought to their appointed spots, each in a progressively farther location from the start, part two begins. At least one character must reach their destination. Failure in part one results in a game over. In part two, the same characters now act as snipers, watching the windows of the building for movement. Doing well in part two means that part three is easier, but part two also takes a lot of paitence and time, and the longer the player takes means he/she will have less time to complete the third part. Part three is the shortest. Three characters on the roof must simply rapel down into the building. Failure to time your movements though results in the character falling.